Since I’ve been toying with writing a few steampunk stories of my own, I decided I should get a better feel for the genre. To that end, I searched my local library system for what would be considered a definitive collection of such tales. At the top of the list was Steampunk! 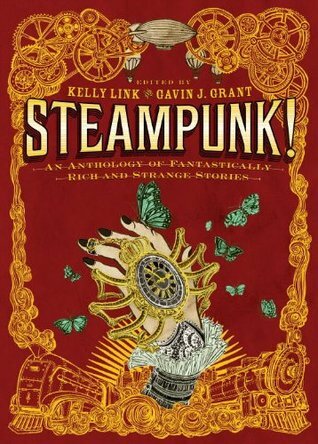 An Anthology of Fantastically Rich and Strange Stories, edited by Kelly Link and Gavin J. Grant. I didn’t know what to expect, so I dived in. Well, that’s not true. I did look up several definitions of “steampunk” online, but then while reading, I started wondering if I hadn’t gotten my wires crossed. I normally don’t read reviews of books I’m planning to review, but I just had to know what I was missing. The most telling Amazon commentator confirmed my fears in that, for the most part, the book is mistitled, and the vast majority of short stories don’t fall within the boundaries of the steampunk definition. Good news is that almost all of the stories are entertaining and held my interest. That said, the two comic strips included added nothing, and in fact, really didn’t “do it” for me. Pet peeve alert. In Libba Bray’s short story “The Last Ride of the Glory Girls,” her main character was rapidly subdued by someone putting an ether-soaked cloth over her face. I had to look this one up before, and as it turns out, movies and TV shows aside, ether and chloroform take long, long minutes to render a person unconscious, not seconds, so Bray didn’t do her homework. The flip side is that I adored the Dylan Horrocks story “Steam Girl,” which in my opinion, is worth the price of admission. True, it’s set in modern times, but if Shanaia isn’t a steampunk refuge stranded in our universe, she ought to be. Anyone who isn’t touched to the depth of their soul by this sad and wonderful tale needs to have their pulse checked, because they might already be dead. Overall, the anthology is a fun ride and well worth reading, but is it steampunk? For the most part, no. I’ll be publishing this review on Amazon as well. Thanks for introducing a word and genre I’ve not heard of before. I’m intrigued! You’re welcome, Keith. The original “punk” was “cyberpunk” and “steampunk spun off of that. There’s also “dieselpunk” and “atompunk” which are completely fascinating. Maybe you’ve written some “stonepunk” in the last year or two, James? I think you lost me on that one, Marleen. Stonepunk? Probably, you haven’t written any stonepunk… as I don’t remember a dystopian approach. Glad I piqued your interest, Marleen. It seems to be considered a defunct genre except for its derivatives (of which, clearly, steampunk is one); apparently generously spanning from 1975 to 1995 (with some guy, Sterling, trying to solidify it it 1986). I found this elucidating: About that time [meaning after 1983], William Gibson’s novel Neuromancer was published, delivering a glimpse of a future encompassed by what became an archetype of cyberpunk “virtual reality”, with the human mind being fed light-based worldscapes through a computer interface. Some, perhaps ironically including Bethke himself, argued at the time that the writers whose style Gibson’s books epitomized should be called “Neuromantics”, a pun on the name of the novel plus “New Romantics”, a term used for a New Wave pop music movement that had just occurred in Britain, but this term did not catch on. Bethke later paraphrased Michael Swanwick’s argument for the term: “the movement writers should properly be termed neuromantics, since so much of what they were doing was clearly Imitation Neuromancer”. I found these two sites somewhat and variously helpful. One of the best ones I have run into is by Kenneth Oppel. The Matt Cruse series- Creepy, fun, violent, and absolutely out of the world and still in it! I’ll have to look it up. Thanks, Kris.